Are you looking for a new and exciting recipe to serve at your Mardi Gras party? Do you want to impress your guests by serving unique tasty food creations at your bash? If so, try these yummy Mardi Gras Alligator Meatballs and you will surely impress your guests. In addition, you will be creating some exciting Mardi Gras fun throughout your party. (Of course, if you don’t have gator meat than you can use chicken instead – don’t worry you will still be creating something exciting and impressive). Delicious Mardi Gras Alligator Meatballs. Bring a large pot of water to a boil, add potatoes and cook until they are tender but slightly firm. This takes about fifteen minutes. Drain. Now, take the potatoes along with the alligator meat (chicken), onions, green onions, celery, parsley and grind all of these ingredients with a meat grinder. Once you have your meat and other ingredients grinded and placed in a large bowl, then add eggs, savory, salt and pepper. Mix all ingredients until well blended. Shape into one inch balls and roll in cracker meal. 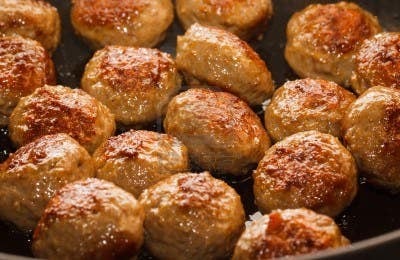 Heat oil in deep fryer to about 375 degrees, fry meatballs until crisp and golden. Drain on paper towels. Serve over rice, noodles or bread. Go ahead, try these delicious alligator meatballs this year at your Mardi Gras party and you surely will impress all the hungry people who attend your party bash. Happy Mardi Gras!